We should probably come up with some kind of standard method of comparison. PM me for a link to the m2v of the S&W Zone Plate from DVE! If you own a DVD recorder or something fancier, please help out! Here is a clip of my Diamond Theater750HD PCI-E card. This is the composite output from my pioneer dv-360 to the Theater750HD. Here is the “Pluge Pulse” test with a comparison of the digital file on the right. I’m not sure what to be looking for here but it seems that the black box on the right with the different shades inside of it shouldn’t be flickering but it does a little bit. I’m sure you guys know more about this than me. Here is the lossless clip of the Pluge test. Here is the clip of the stormtroopers looking for Leia on the Tantive. It’s a lossless encode to lagarith and weighs in at 80MB. This should serve as a good test for the comb filter according to Poita and Antcufaalb. I uploaded it to sendspace instead. Here is a clip of my Diamond Theater750HD PCI-E card. Can you post a short clip of a fast moving scene with some sharp scene-changes from one of your captures as well? I'm interested to see if the Diamond Theater750HD exhibits any "checkerboarding" like my Panasonic DMR-ES10 does. Actually, can you just post the last frame before a sharp scene-change and the first 1-3 frames after? EDIT: Youtube compression kinda yucks it up but I'll leave it there for anyone who wants to check it out. The screenshot looks about like the capture though. Can you upload it to SendSpace? It is done. Just click the original link and it will now direct you to sendspace instead of YT. I'm sure you've got a scene or two in mind from Star wars you could use as a reference. If you just tell me which one I can try to put it up on Sendspace. 1. "The scene where the storm troopers are searching for leia tests the 3D comb filter, lots of quick scene changes, intense reds, the blue of the stun ray and the fine detail around the doorway and floor grids." 2. "The other scene is R2 moving throught the canyon, the close-up panning shot reveals any smearing created by the comb filter." Ok I put up the scene of the stormtroopers and leia. I put the link in my first post to ease finding it in the future. Did you see any checkerboarding on the first frame after a sharp scene-change? It's an easy-to-spot artifact, so you can't miss it. If there is I don't think it's much. If it's not too much to ask: Can you post the following two images? There's no checkerboarding at all AFAICT. I guess the only thing left is to see if it exhibits the same AGC issues as the USB one. If it doesn't, then this is definitely the best capture card on the market. Sure. Send it on over. I'm in the middle of recapturing the SE and DC because I accidentally captured it in yv12 the first time :(. Seriously, that's like 12+ hours of my life gone down the drain lol. Anyway, I'll try to get it to you tonight between discs though. Anyway, I'll try to get it to you tonight between discs though. I don't have it uploaded anywhere, so I'll have to send it to you when I get home from work in ~2.5 hours. I'm in the middle of recapturing the SE and DC because I accidentally captured it in yv12 the first time :(. Seriously, that's like 12+ hours of my life gone down the drain lol. I know how you feel. I can't even begin to tell you how many times I've captured PS78 and had to scrap it because I realized that a setting was wrong. Ugh! Do you have a late-issue DC pressing? If so, then it's supposedly identical to the THX "Faces" set, but higher quality because it's CAV rather than CLV. It is the early pressing that is missing a few seconds of esb where leia is welding on the falcon. That's awesome. It has 100% split-lightsabers, then. The late-issue pressing replaced some of the most offensive split-lightsaber shots. I don't think we have a nice preservation of that one. Cool! althor1138: I PM'd you the link to the DVE Pluge Pattern. I got it now. I've got some things to do today so either tonight or tomorrow I'll post the results. 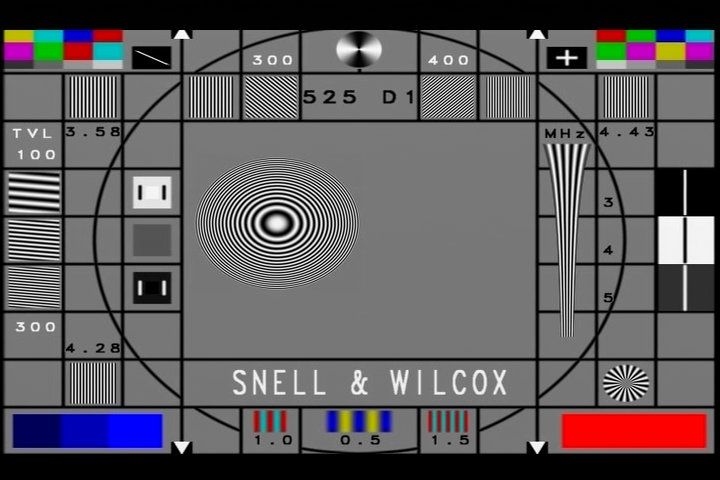 Do you have any more test patterns? I'll take everything you've got if you don't mind. Maybe I should just look online for it. I've updated post #2 with the "pluge pulse" test. I don't know what I should be looking for exactly but it seems like the box on the left does flicker a bit so is it totally failing or is it just moderately bad at this test? Thanks. Can you upload a losslessly-compressed (e.g., Lagarith) version? Some codecs mess with the luma levels to avoid certain artifacts.